Who likes to clean a plastic male urinal after use? You don't have to do it anymore! The Carebag Men's Urinal Bag has been designed to effectively catch and contain urine and spare you the trouble of cleaning up your clothes, bed sheets or floor in case of spillage. 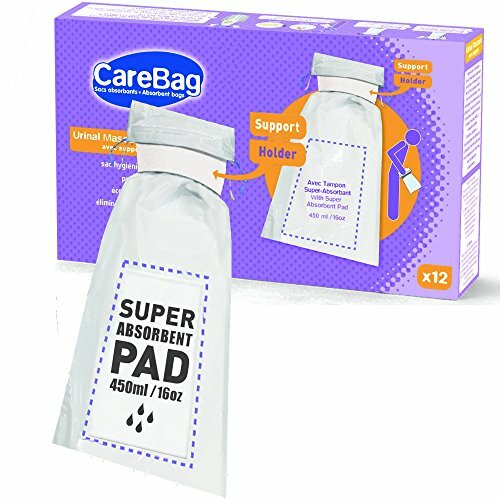 It is a green friendly medical grade bag equipped with a convenient green-friendly holder and unique super absorbent pad which turns up to 16oz of urine into a gel within seconds. Designed for both children and adults, it is the ideal solution for bedridden individuals, people subject to stress incontinence or simply when a toilet is not available. Super absorbent pad turns up to 16oz of urine into a gel: no more spills or splashes! Single-use item; no more cleaning plastic urinals! Convenient green-friendly holder allows single hand use and easy aim! If you have any questions about this product by Cleanis, contact us by completing and submitting the form below. If you are looking for a specif part number, please include it with your message.